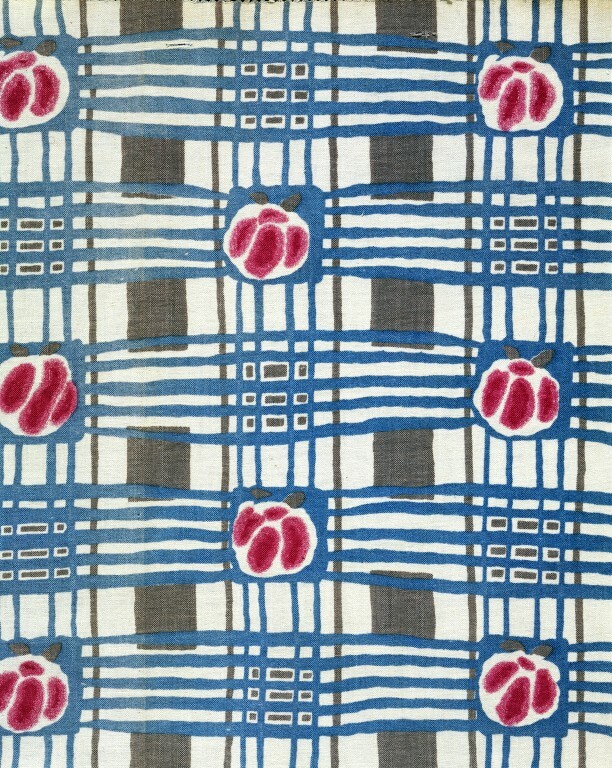 This furnishing fabric was designed by Constance Irving for William Foxton in 1926. The grid background and simplified roses are typical of French-influenced textiles of the time. The firm of William Foxton Ltd., founded in 1903, produced some of the most innovative artist-designed textiles of the 1920s. It commissioned artists such as Charles Rennie Mackintosh, Claude Lovat Fraser, F. Gregory Brown and Minnie McLeish. In 1915 William Foxton helped to found the Design and Industries Association. The aim was to improve the standard of British industrial design by exhibiting new designs and communicating information about them to those working in the field. Constance Irving was an artist who exhibited work in the second Post-Impressionist and Cubist exhibition which took place in Liverpool between March nd April 1911. This was the first time that works by the artists Gauguin, Van Gogh, Cezanne, Matisse and Picasso were shown outside London, and only the second time that their work had been exhibited in the UK. The exhibition exhibited work by the continental artists alongside work by their British contemporaries, including Augustus John, John Lavery, Philip Wilson Steer and Henry Tonks. 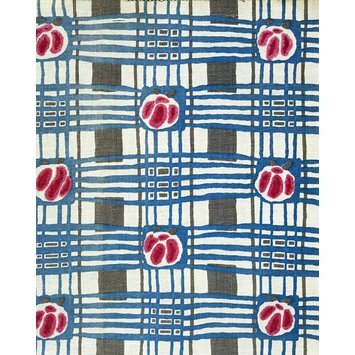 Irving supplied a number of designs for Foxton's during the 1920s; her painterly style embraced both colourful florals and bold, abstract patterns. Furnishing fabric of roller-printed cretonne in blue, greay and pink. The pattern includes a design of idiosyncratic plaid with simplified pink roses on a white backgrond. Samuels, Charlotte. Art Deco Textiles. London : V&A Publications, 2003. Plate 96.